Your cat needs the very best nutrition to keep it looking and feeling great, which is where Meowing Heads Gone Fishin Adult White Fish and Chicken Dry Cat Food comes in. This delectable dish is packed full of eΒential nutrients needed to keep your cat's health in optimum condition and enable a happy and active lifestyle. Omega-3, omega-6 and zinc sulphate are vital elements of this recipe, as they keep your cat's skin radiantly healthy and fur luxuriously gloΒy. 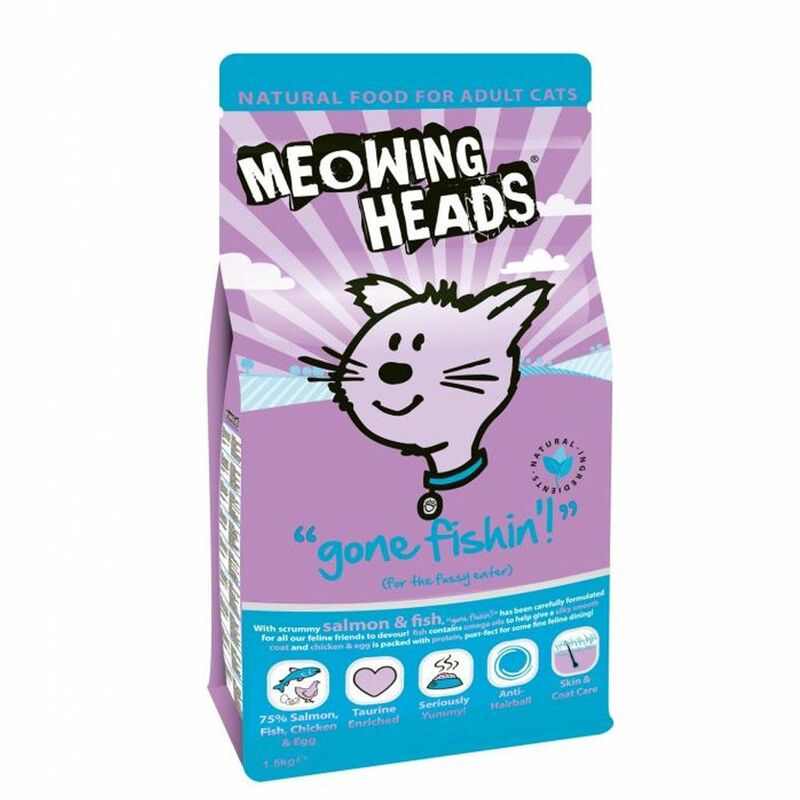 The balanced recipe of Meowing Heads Gone Fishin Adult White Fish and Chicken Dry Cat Food uses 100% natural ingredients and boasts a particularly high protein content. This is the ultimate dish for the fish-lover, with 75% salmon, fish, chicken and egg. It is completely free from artificial additives such as flavours, colours and preservatives, yet contains a range of beneficial ingredients to keep your cat healthy and active. Taurine looks after your cat's heart, cranberry extract looks after the urinary tract and works to neutralise free radicals, while added vegetable fibre helps to prevent the build up of hairballs by moving hair on through the gut. Offer your cat the very best in balanced, protein-rich nutrition with this delectable dish in modern, colourful packaging. Meowing Heads Gone Fishin Adult White Fish and Chicken at a glance: Complete balanced dry food for adult cats Specially-designed recipe to ensure your cat's overall wellbeing, inside and out 100% natural: with high-quality, selected ingredients and free from artificial colours, flavours and preservatives Rich in protein and flavour with 75% salmon, fish, chicken and eggs With taurine to keep eyesight and heart strong Contains cranberry extract: a rich source of antioxidants and great for the urinary tract With zinc, omega-3 and omega-6 to keep skin healthy and coat gleaming Anti-hairball recipe: the additional vegetable fibre in this recipe ensures good digestion and keeps stray hairs moving through the system Balanced ingredients including vegetables, grains and plant extracts, all of which are great sources of vitamins, minerals and trace elements With seaweed: this natural source of calcium keeps bones and teeth healthy and strong Well accepted: this delectable dish is particularly popular thanks to its natural, premium ingredients Made in the UK by premium pet food manufacturer Barking Heads.